Say goodbye to Julio as he prepares to depart for Cuba. Tickets only $7.50. 3 meal choices at Mi Casa Su Casa. West Reading Block Outdoor Reception, Reading Eagle August 26, 2018 here. "MADE IN CUBA" Exhibit on WFMZ's "One Tank Trip"
Julio Cesar Cepeda Duque is an artist who lives in Trinidad, Cuba. Martha and Jay Ressler of Hamburg, PA saw his work in a gallery in Trinidad in March of 2015. They connected to it immediately on a visceral level. When they got home they contacted him and began to think seriously about bringing him to Reading, PA for an exhibit at GoggleWorks Art Center in Reading, PA.
We are hoping that you will help. Julio will be in the Reading area for two months at the time the show opens in Sept, 2018. 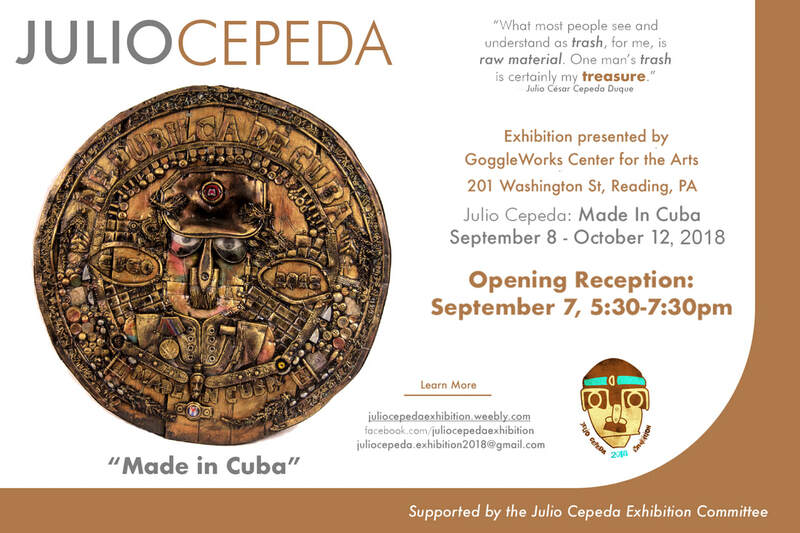 ​GoggleWorks issued the invitation to Julio for an Exhibit in September/October 2018. There will still be numerous expenses, and Julio's means of raising the money himself are very limited. We will need in the range of $15,000 for airfare, visa, taxes and shipping fees, plus publicity, fundraising event fees, and other expenses while he is in the U.S.
Julio is creating public sculptural murals in Reading and West Reading as an act of friendship and hope. In addition to a workshop he will teach at GoggleWorks, there will be time available for studio and gallery visits and other activities. To sign up for his GoggleWorks workshop go here. Please let us know if you would like to help and be part of this exciting cultural exchange.